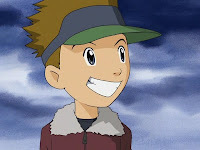 Digimon: System Restore: Tamers Episode 46: When Is A Mon Justimon? In this episode, guess who's coming in yet again to bail out the good guys, saving the day and acting all high and mighty. Wait... Kenta? He stands tall and proud, overlooking the city. His city. The one he has sworn to defend. He arrived a stranger, but now he calls it home. By day, he is Ryo Akiyama. Armed with chiseled good looks and a disarming smile, he has become a legend- the king of the children's card game Digimon. 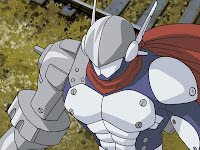 By night, the game comes to life and he and his trusty sidekick Cyberdramon become the hero the city deserves... JUSTIMON! For Great Justice. Oh, it's so good to see everybody else stealing the spotlight from him for a change. In an episode that could have been all about Ryo's awesome new evolution and him single-handedly bailing out Takato, Rika and Henry, he instead joins the second string support team. His effort is important as he takes on a Horn Striker agent one-on-one, but ultimately no more crucial than MarineAngemon and relying heavily on Guardromon and Antylamon to finish the job. The decision to give Ryo a bio-merge form is tolerated only because expecting Takato, Henry and Rika to do all the heavy lifting is unfair. Picturing the final battle without a fourth Mega in the picture is difficult (which says a lot about the opposition as Data Squad is the only other series where the good guys get four Megas). Otherwise, Justimon's a downright travesty. Call me old-fashioned, but in my day, kids had to earn their new evolutions. Give us some dire situation, some personal soul-searching, or some moment of shared epiphany with your partner. In Adventure, only Gabumon's Mega form was magically bestowed rather than earned, and we all saw how that one turned out. Each of the first three bio-merges were intense, intimate experiences involving lost innocence, fierce determination or quiet sacrifice. It would be one thing if Ryo had a moment like that, especially as we might finally see what goes on in Cyberdramon's head, but to have him just show up in the nick of time taints the concept a bit. He wasn't even anywhere near Dobermon's fireworks and it's really hard to tell whether or not that makes the whole thing a plothole. Justimon's not the only one riding to the rescue, however. 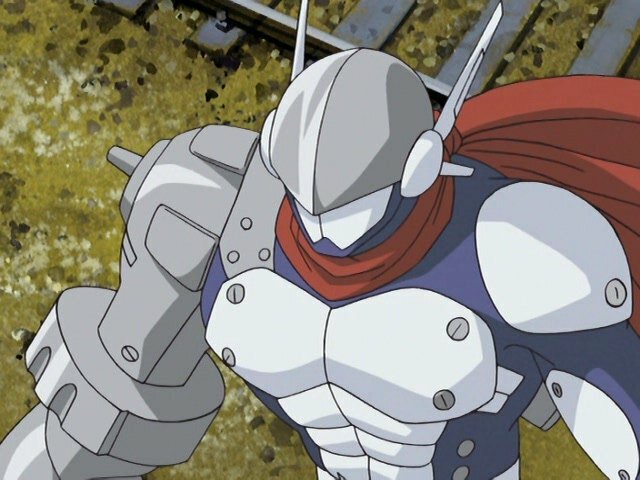 He joins all of the other Digimon in converging on the battle in order to lend a hand. That's sort of the theme of the episode, and we're certainly not going to exclude Ryo from this party. 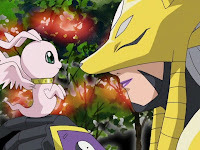 Justimon and Guardromon take over the battle to allow Sakuyamon and MegaGargomon to go after Takato. While Justimon does the bulk of the work against Horn Striker, Guardromon comes in with another key save (just as he did during the Gallantmon/Beelzemon fight) and Antylamon finally shows up to help deliver the finishing blow. Problematic as Justimon may be, the B-Team collectively finishing off the most imposing agent yet is impressive. Kenta and MarineAngemon really steal the show here. As Jeri-Type continues to thoroughly wreck Takato's brain and prepares a finishing blow, little MarineAngemon proves his mettle with a Kahuna Waves attack that is super effective against D-Reaper. For a last-second toss in, MarineAngemon is a clever addition to the team, a sort of white mage that does nothing but offer healing and protection, which D-Reaper can't stand. As an added bonus, he's tiny and adorable! Jeri-Type's continued torture is especially cruel this episode as it covers not only Jeri's happier times and early dismissal of Digimon, but also her assertion that she's an awful person. While all the tamers are running around, Calumon and Impmon discover the Kernal Sphere where Jeri is held captive. Calumon is able to sneak in and keep Jeri company. Beelzemon is more or less crucified. Between his murder of Leomon and killing the first Pendulum Feet, it's not a surprise that D-Reaper may not be fond of him. You also have to love that Suzie and Tally are the ones who see all this happening while their colleagues are out doing “important” stuff. MarineAngemon doesn't exactly have full command of the English language in the dub, and he's still adorable, but in the original Japanese version he only speaks variants of “pa pi pu” and other such syllables that may comprise the Dokuro-chan opening. Kenta is the only one who understands what he's saying. And yes, like all the Digimon, MarineAngemon has his own image song, where he only sings variants of “pa pi pu.” It's mega-adorable. Completing the “I don't know what that was about but it was awesome” essence of her character, Alice vanishes into thin air as she walks away from the battle. Congratulations. I found this site off of Google yesterday when I was trying to figure out exactly what Matt's father's name was (just bought the first season off of Wal-Mart, $35 for 56 episodes, boo-yah)...and as of this writing, I've read almost every single post you've written...only ones I've stayed away from are the 01 episodes I haven't gotten around to watching yet. You are absolutely addicting and I'll keep reading and anticipating your analysis...es...Anyways! Bravo on utterly addicting me in 24 hours, keep up the good work! Another testament to the awesome power of HIROAKI ISHIDA! Thanks for reading! Do you really feel that Ryo was needed as a character? Not just in the final battle but in the season in general? He's a cool character but he doesnt add much to the group. I re watched the final fight and he didn't seem to do much that couldn't have been done by Henry or Rika in their mega forms. Not to mention mostly all of the fights they took on all season were done in a trio since the beginning. The Devas, Beelzemon and a few other fights as well. It's oficial.Guardromon is a life saver. He hit Beelzemon when he was about to kill Gallantamon. He hit the agent when he was about to kill Justimon. Despite not fighting a lot,without Guardromon,Takato,Guilmon,Ryo and Cyberdramon would be long dead. What I find shocking is that Ryo biomerges with an Ultimate, as far as we know. If you're going off what we've seen in the anime, it's much more reasonable that he biomerged with the rookie, since that's the form in which we last saw his digimon partner. Doesn't he appear before the last battle with Cyberdramon and biomerge there? Ryo was featured to appeal to the members of the Japanese audience who had played the popular Wonderswan games in which he was the main character (with the exception of Tag Tamers, arguably). I remember reading somewhere that Ryo's appearance (and I would guess, to some extent, role) in Tamers was decided on by the Toei execs and Konaka had no say in the matter. So yeah, he was more or less superfluous from the start. Just have to say, Jeri-Type's true form's look reminded me a LOT of Valentina from Super Mario RPG. Even Valentina's theme fits her!